Virabhadra Puja Vidhi - Procedure with Virabhadra Mantra – How to perform a simple puja of Veerabhadra Swamy at home? Virabhadra, also known as Veerabhadra Swamy, is one of the Shiva Ganas. 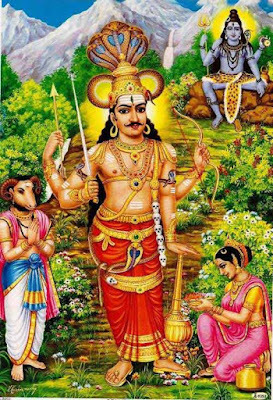 Below is Virabhadra puja vidhi – procedure with mantra. Virabhadra appeared when an angry Shiva on hearing the news of the death of Sati at Daksha Yajna took out a hair from his head and threw it down. You can perform the puja of Virabhadra on any day. Please note that this is a simple how to do guide and is meant for devotees to do it on their own at home. When to Perform Virabhadra Puja? Hasta Nakshatra falling during the waning phase of moon. It is doubly auspicious when there is Hasta Nakshatra on Krishna Paksha Dasami tithi or Chaturdashi Tithi. Various difficulties in life will be removed. Respect and recognition in society. To achieve fame and fortune. How to perform simple puja of Virabhadra? The puja should be performed facing South. The murti (picture, photo or painting) of Virabhadra standing should be used for worship. If there is no picture of Virabhadra then you can use that of Shiva or a Shivling. The murti should be placed on a red color cloth. Dhoop should be of gugal. Red chandan should be offered and the devotee should later wear it on his forehead. Red color flowers should be offered to Veerabhadra. Food (bhog – Prasad – naivedya) on the day should be prepared using jaggery. The food should be distributed as Prasad. The mantra ॐ ह्रौं हूं वं वीरभद्राय नमः॥ (Om Hroum Hoom Vam Veerabhadraya Namah) should be chanted 108 times using a red chandan mala. Sindhoor should be offered to Virabhadra for achieving respect and recognition. Offer masoor dal to Virabhadra and keep a little of it in purse for overcoming difficulties in life. To defeat enemies take six lemon and make a garland of it using red thread and offer it to Virabhadra.